Movie: "I Sell The Dead"
Plot: Two Victorian grave robbers try to eke out a living by exhuming corpses and selling them to a local Doctor. They soon come to discover that supernatural corpses fetch them a much higher price than normal human bodies. Review: I Sell The Dead is set around 1850s Ireland and is a horror comedy focusing more on the latter. First off it boasts an excellent cast featuring Dominic Monaghan, Ron Pearlman, and most importantly, horror great Angus Scrimm! The only area in which the movie suffers is the painfully obvious low budget that the crew had to work with. However, ISTD does make up with this in some ways, such as the special effects. Rather than relying on CGI to provide the effects for the supernatural creatures of the film, some pretty solid makeup work is used. To ease the burden on budget, scene transitions often take the form of comic panels that are similar to those used in Creepshow. Other than some setbacks due to the budget, the movie is solid. 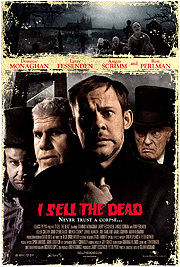 I Sell The Dead is primarily carried by the lead, Arthur Blake, played by Dominic Monaghan, and Willie Grimes, played by Larry Fessenden. The movie starts out with a typical setup, Arthur is about to be executed and is confessing his sins to a priest played by Ron Perlman. Now at this point you are probably thinking Ron Perlman isn’t exactly ideal for a priest, well you’d be right if that didn’t come into play later. Angus Scrimm (yes, the Tall Man from the Phantasm films) steals the scenes that he is in as the eccentric doctor. The movie is told via a series of flashbacks, a rather hackneyed premise, but hey it’s a horror-comedy film, so it is acceptable. Most of the movie is rather predictable, but that doesn't take away from it being a fun watch. Monaghan and Fessenden play well of each other, with both playing the part of straight man at some point. The movie is a mix of unexpected horror sequences and slapstick comedy almost similar to the first Evil Dead. Overall, I Sell The Dead has a nice B-movie feel to it. If you haven’t already seen it, I would highly recommend doing so if only to pass some time. Personally, I loved this movie and it actually made me laugh out loud, which is rare with horror comedies. Most horror comedies try too hard, I felt that I Sell The Dead had just the right amount of enthusiasm for its comedy. So if you need a good movie to watch, rent it, queue it up on your Netflix, or hell steal it for all I care... just make sure you see this movie. Gawd I loved that film so frikken much. I enjoyed it as well. Seeing Scrimm dressed up in a black suit, eyes bulging at the camera really put a pain in my heart though. The man is still sharp and healthy, but it looks like at this rate he won't be with us before the phantasm crew can get their act together and make a final sequel. I know the feeling. I fear I'll never get closure with Phantasm. It was the only Horror movie that gave me nightmares as a child. "Bad guy appears, kills a bunch of teenagers, one teenager kills the bad guy, bad guy magically reappears in sequel for no apparent reason,.... rinse, repeat"
So the fact that phantasam actually has a real plot and IV left us with a cliff-hanger is the real crime here. I'm just glad to see this review spurred a discussion about Phantasm and how they really need to wrap up the story with one final film. Sometimes you I-Mockery folks make me really proud. Let's force them to make one. As long as I get a picture with Scrimm. Sounds great. I just put it in the top slot of my Netflix queue.